Welcome to the Open AI Tanzania Challenge! Maps are absolutely essential for decision support. Knowing where buildings are located is a fundamental input for urban planning, public safety, public health, disaster response, environmental protection, sustainable development and census data, for example. Some of these applications typically require timely and high-resolution maps. Take the following scenario: a local organization that provides low-cost solar panels to low-income households in rural Tanzania is evaluating a large neighborhood with many small houses. They have to determine how to best optimize the installation and distribution of their panels. So they need to know which of the residential structures are oriented in a way that makes them more suitable for solar panels. Knowing where these small houses are and what their orientation is vis-a-vis the sun and surrounding trees, what their roofs look like to determine where to place the panels, and what materials the roofs are made of are all key inputs for their planning. This is just one of many applications for high-resolution maps. Aerial imagery make for the highest resolution maps possible. Increasingly larger areas can be covered using small commercial mapping drones. Take our friends at Sunbird, for example, who are members of our Flying Labs in La Réunion. Their small, solar-powered drones fly for upwards of 10 hours. As such, aerial imagery is quickly becoming a Big Data problem. A single 20-minute drone flight can capture 800 high-resolution images, for example. Academic research has shown that trained analysts will take ~ 1 minute to analyze a single high-resolution image. Manually analyzing 800 images from a 20-minute flight can therefore take 13 hours. This explains why we launched the Open AI Challenge earlier this year. The first challenge focused on food security in the South Pacific and was organized in partnership with our friends at the World Bank, OpenAerialMap and our Pacific Flying Labs. Our next challenge — Open AI Tanzania — is a partnership with our friends at the State University of Zanzibar (SUZA), World Bank, OpenAerialMap and Tanzania Flying Labs. 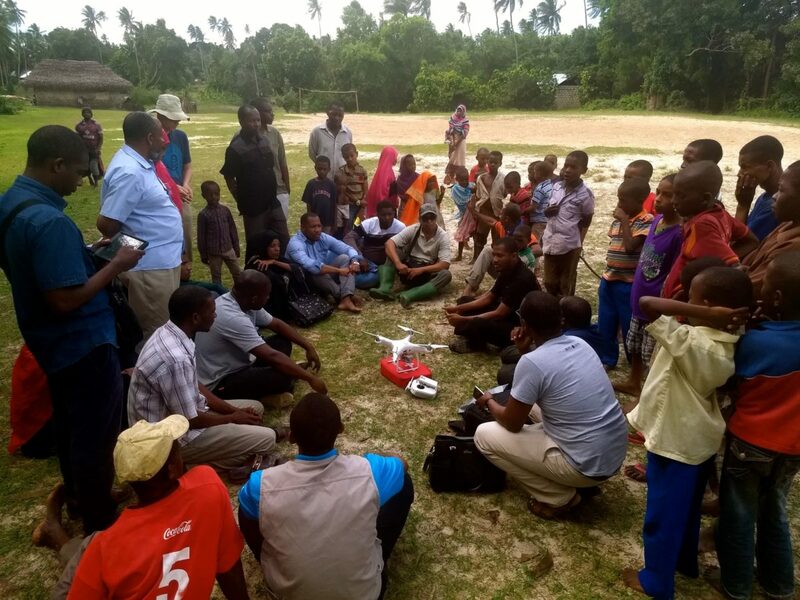 Open AI Tanzania will invite data scientists to develop feature detection algorithms that can automatically identify buildings, building types, roof materials and more using high-resolution aerial imagery collected by Tanzanian drone pilots through the Zanzibar Mapping Initiative (ZMI). Our core mission at WeRobotics is to localize opportunity, hence our Flying Labs. This explains why we’re also keen to invite local participation in this challenge. We’re therefore teaming up with our friends at Black in AI and DataKind to directly invite African data scientists across the country, continent and the world to this Tanzanian project. All our Open AI Challenges are of course open, which means everyone is invited to participate. The winning machine learning classifiers will be used by our partners to inform a wide range of social good efforts across Zanzibar and the rest of Tanzania. This includes (and is not limited to) urban planning, public safety, public health, disaster response, environmental protection, sustainable development and census data. As such, we encourage participants who take up the Tanzania Challenge to consider making their classifiers open source. Open AI Tanzania will be formally launched at FOSS4G in Dar es Salaam on August 28, 2018. The challenge will run through November 1st and the winners will be announced on November 15th. If you’re interested in participating, please be sure to sign up here by September 1st at the latest. We’ll contact you on September 1st to share the imagery, training data, evaluation metrics and additional materials. In the meantime, we want to express our sincerest thanks and deep appreciation to Dr Muhammad Juma, Director of Urban Planning, the Commision for Land (COLA), SUZA, OpenAerialMap, Spatial Collective and the World Bank for making the data available and for supporting Open AI Tanzania. We’d also like to thank Jordan Yap for his continued support in setting up and evaluating the results of these Open AI Challenges.